Few smells in life are more reminiscent than freshly-baked bread. Take a moment and try to recall what place the comforting and nourishing scent of fresh bread reminds you of. Perhaps your grandmother pulled out her bread-maker every time you came over to visit, and even let you pick out the ingredients for her loaves. Perhaps your dad used to take you to the market early in the morning before school to pick up fresh loaves to make sandwiches. Freshly-baked bread reminds many of us about the holidays and traditions that define our beliefs and our families. No matter what memory fresh bread invokes in you, it’s most likely a positive one. However, it’s unlikely that the over-processed, store-bought bread that you picked up at the mega mart invokes the same emotion. Many people are turned off and intimidated by making their own bread because it sounds difficult and time consuming. After browsing just a couple bread recipes, you’ll quickly find that making your own bread at home can be nutritious, delicious, and cost-effective. Whether by oven or bread maker, you can better understand and control what goes into your diet when you create loaves with your own two hands using ingredients that you trust. It’s no secret that many carbohydrate and calorie-rich breads don’t get exactly rave reviews from nutritionists. Boost the health quotient of your homemade loaves by incorporating all-natural supplements that enhance the taste and nutritional value of your recipe. Regardless of the season, give this Warm Winter Nut Bread recipe a try next time you find yourself craving wholesome and nutritional grains. 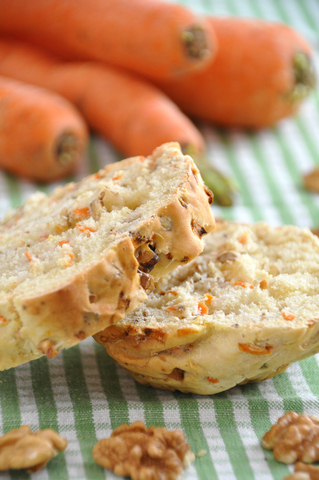 The secret ingredient in this bread recipe is carrot powder, which is an amazing source of Vitamins A, B, C, D, E, and K. How many loaves on the mega mart’s shelf can pack that kind of vitamin punch? Have a recipe of your own to share? Place a comment below and let us know! Kat Braza - Is this a cheaper way for gluten-free? Gluten-free bread costs an arm and a leg for a smaller loaf! Trayvon - Yes Kat, making your own gluten-free bread would be cheaper and could be made to your liking. I know gluten-free bread from the store don’t taste great! sarahluvzveggies - same here lauren – never really ate freshly baked bread. i went to a local farmers market recently in my area and there was a vendor that had quite a selection of breads. that may be an ideal place to go.